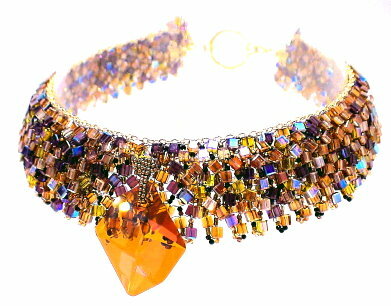 Visit Land of Odds - Jewelry Design Center for all your beading and jewelry making supplies. when you construct a piece of jewelry. - Learn how to make choices about how to buy beads and other jewelry findings, what goes together with what and when, what happens to all these pieces over time, and what the the quality is of the pieces you are using, whether beads, metals, or stringing materials, and, finally, how to relate this to design goals, and if you are selling your stuff, your marketing goals as well. - Learn the basics of bead stringing and attaching clasps, including crimping, stringing with needle and thread, and pearl knotting. 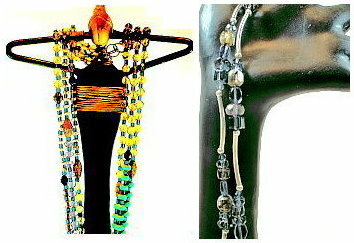 - Learn to make amulet bags, beaded sculptures, beaded vessels, necklaces, bracelets, loomwork, appliqués and more. Many projects attempt to emulate a piece of cloth or textile. Other projects are more figural or sculptural. There are many different techniques of bead weaving. The most popular are peyote stitch, loom work, brick stitch, ndebele, and netting. Already familiar with a stitch? Or, how to execute a stitch? 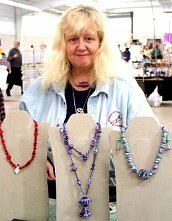 - Learn how to get started in your jewelry making business including setting up a simple accounting system, knowing federal, state and local accounts to set up and forms to fill out, how to price using a formula, sell and market your jewelry, how to market your jewelry on-line, and pointers about doing craft shows. then please email your message again. 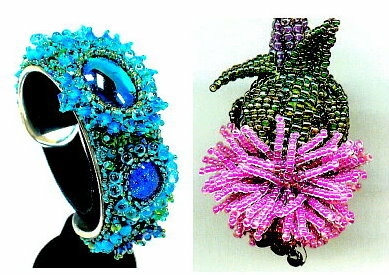 The Open Window Gallery is located within the Be Dazzled Beads store. The Center for Beadwork & Jewelry Arts holds most of its classes at Be Dazzled Beads, but some classes at James Jones Studios and other locations as well. 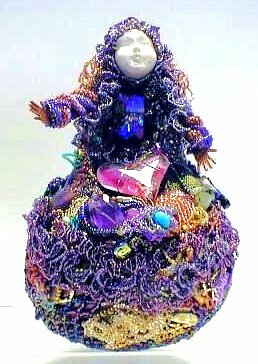 Register to receive announcements of classes, Be Dazzled Specials, happenings in The Gallery under the Yahoo beadschool group. If you need to update your billing address/zip, change your password, or check on your order history, go here. please CLICK above, and we will append these to your order. You would bring up your shopping cart. On the next screen, first check the second button that indicates you already have a customer profile set up. Then check the box that says something like Change, Update, Correct typos in credit card information. The next screen that comes up is a form to fill in your credit card information again. Log in and correct your profile information. RETURNS: Return Authorization Number required for all returns. Please call or e-mail us for a RA# before shipping. All returns must be properly packaged, and have a valid RA# prominently written on outside of the box. No returns on any product after 30 days! See our Order Information section on Returns, Refunds, Re-Stocking Fees to review specific conditions and terms. For some returns, a 25% re-stocking fee will be charged (on value of items before any discounts), and this section specifies when such a fee will be applied. TELEPHONE AND FAX ORDERS: Processing of orders placed on-line begins within 1 business day of receipt. There is usually a delay of 2-3 business days before orders phoned or faxed in are begun to be processed. This is because, as computers have taken over many staff functions, a staff person must replace your order on-line before it can be processed. ORDER TURNAROUND TIME: When an order is received, we try to fill it completely with items in stock. If everything is in stock, the order will ship that day or the next day. If items are not in stock, we try to get the items from the distributor, and ship the order as complete as possible. This results in a shipping delay of 3-5 days, before the order is shipped. Even if you indicate that you want 2-Day or Overnight shipping, there may be a delay of 3-5 days before the order is shipped, unless you have emailed us ADDITIONAL INSTRUCTIONS directing us otherwise. IF AN ITEM IS OUT OF STOCK: Land of Odds does not backorder items. We ship all items that are in stock, and out-of-stock (O/S) those items which are not currently available from us, or from our distributors. If you are ordering SEVERAL ITEMS WHICH YOU MUST HAVE "ALL OR NONE", then please email or notify us of this fact when you place your order. Normally, we ship what is available, and out-of-stock the rest. Runner Up Prize: $399.07 shopping spree on Land of Odds web-site. 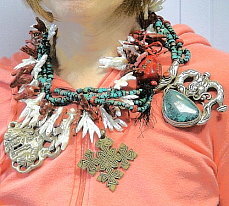 Immerse yourself into a week-long study of jewelry design theories, and their applications and manipulations with various materials, techniques and strategies.